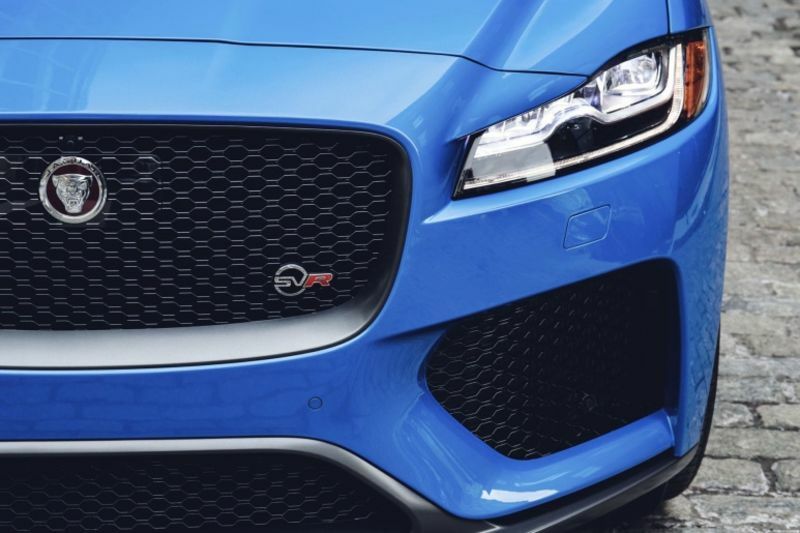 Jaguar's now familiar SVR features a supercharged 5. 0-litre V8 and produces 550 horsepower and 502 pound-feet of torque. Jaguar estimates it will hit 60 mph in 4.1 seconds and a top speed of 176 mph, which will make it one of the quickest and fastest SUVs on the road when it arrives in dealerships this summer. The F-Pace is not just one big engine, it also features upgraded mechanical improvements and enhancements including stiffer springs, wider and lighter forged alloy wheels (21- or 22 inches), bigger brakes (15.5-inch front, 15.6-inch rear), an electronic active rear differential, a variable active exhaust that's 14.5 pounds lighter than the standard one, and specially tuned software for adaptive suspension, electric steering, eight-speed automatic, all-wheel drive and Dynamic Driving Mode. The fastest F-Pace joins a rarefied club of fire-spitting adventure vehicles, the BMX X5 M, Mercedes-AMG GLE 63, Range Rover Sports SVR, and Porsche Cayenne Turbo. The F-Pace has enlarged front air intakes, and side fender vents to reduce lift and provide extra cooling while also optimising high-speed stability. The SVR also has some added visual sizzle with flared wheel arches, lower body mouldings for a more low-slung look, and bonnet vents that also provide extra cooling for the supercharged V8. Inside the range-topping F-Pace are slimline performance front seats that provide enhanced lateral support and have a signature 'lozenge' quilting and embossed SVR logos. The pistol-like sports gear selector shifter, as used in the Jaguar F-Type, replaces the standard rotary shifter design. The F-Pace will go on sale in South Africa in the second half of 2018, at a price yet to be announced, but according to an online source, the starting price would be around $80,985.